These are not your ordinary soy candles which are normally a mixture of soy wax and paraffin wax. At Beanpod candles they use nothing but real soy bean wax. Taking great pride in their candles and products. say they are a green company who only uses the finest products in the candle making process. They are a super clean candle which means they release no soot at all when burning. This is wonderful for person’s with allergies such as myself. 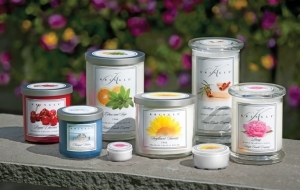 Each candle is infused with essential oils for a variety of fragrances. In fact they have over 30 scents to delight even the finest candle discriminating nose. That’s just in the candle jars alone. They also have a large variety of tea lights and votives to choose from. it took was one little whiff to get this taste buds going and he too was instantly a new customer. I can’t rave enough about Beanpod candles. Try one for yourself and you will become a fan for life. On a scale of 1 - 10, with 10 being the highest score I am delighted to say that Beanpod candles gets a 12 in my book. Many thumbs up to their product.